Enthusiasm ruled this morning at Johnson Elementary School. 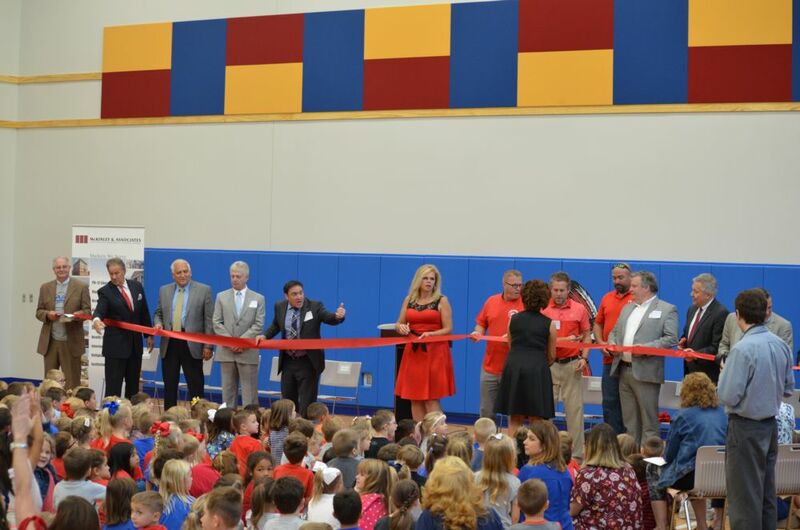 The entire student body and staff joined school administration, representatives of the county school board, city government and elected officials – as well as architects and contractors of the brand new school building – for a dedication and ribbon cutting. 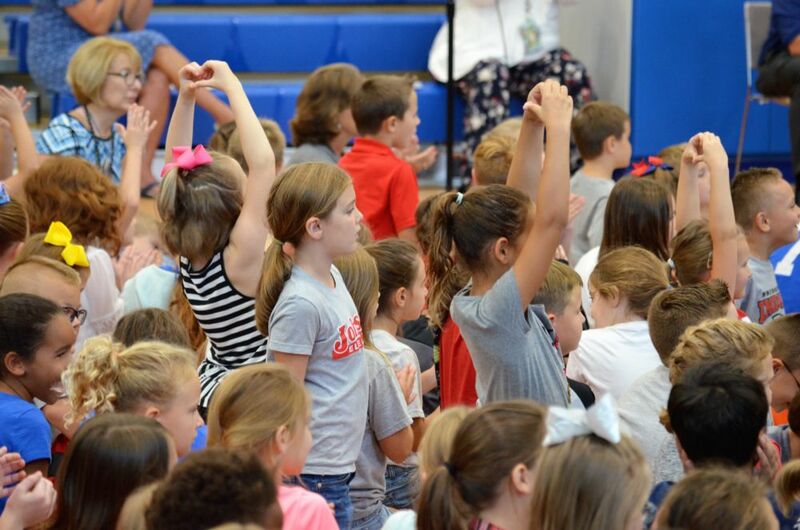 American Legion Post 68 led a spirited Pledge of Allegiance, after which the young students went on to recite their school motto with obvious pride. The Rev. Thomas P. Horne of LifeWay Bible Fellowship led prayer before festivities commenced. 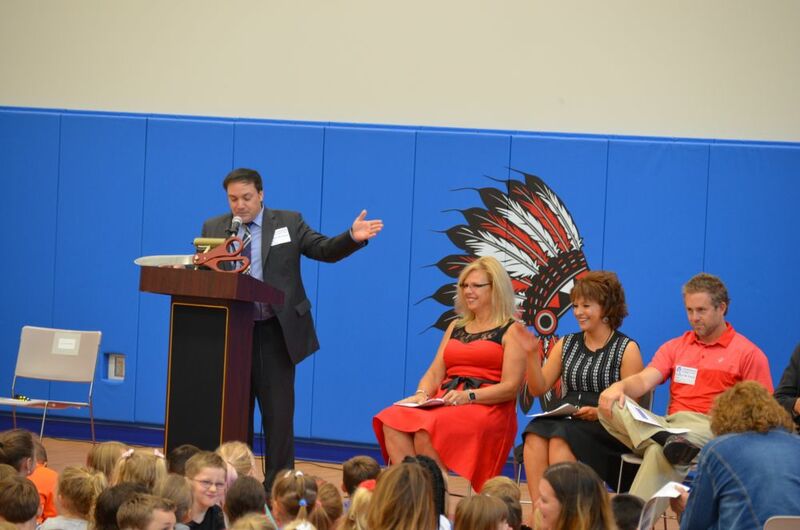 President of Harrison County Schools Frank Devono, Jr. reminisced about the groundbreaking ceremony which took place about a year ago. It was a culmination, Devono said, of numerous individuals, hard work, planning and communication. “And in my opinion, that goal has been achieved and exceeded our expectations,” he said. Devono recognized Bridgeport City Council: Mayor Andy Lang, Recorder Hank Murray, Dustin Vincent, Lowell Maxey, Robert Greer, Jeff Smell and John Wilson, as well as former City Councilwoman Diana Marra and former Assistant School Superintendents Anthony Fratto and Wendy Imperial; all who were instrumental in the project. 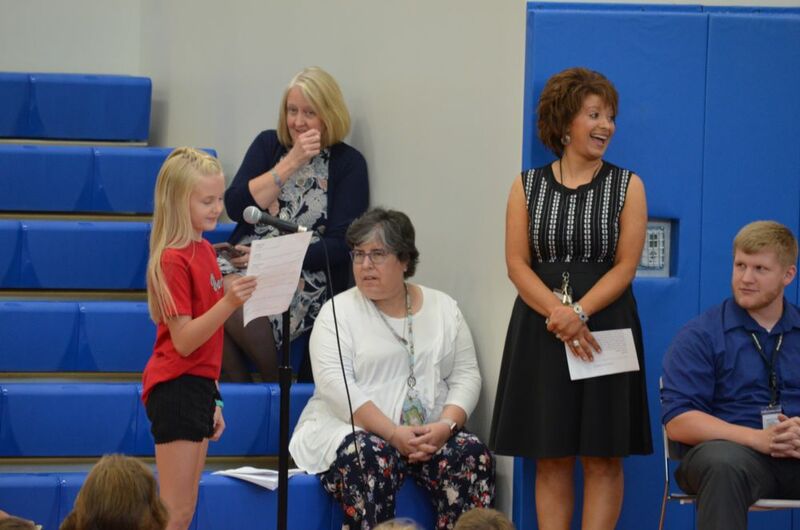 Because JES is so kid-centered, featured speakers were representatives of the study body, who worked with Librarian Marylou Smith to communicate what they love best about their new school. Some liked the shiny, new classrooms, the solar panels and the rainbow floor in the cafeteria. Others mentioned the addition of preschool, the abundance of windows and even the water bottle refill system. Huffman reminded attendees that the building was done in two stages; the first, to design it and the second, to actually construct it. She and Assistant Principal Heather Horne Holbert presented representatives of both McKinley and Associates – Ernest Dellatorre - and City Window & Construction – Beau and Brian Henderson, as well as company founder Bud Henderson - with Johnson Elementary T-shirts in appreciation for listening to all the input and for creating and building “the best school ever;” a phrase which brought a rekindle of enthusiastic applause. The official ribbon cutting followed, after which Beau Henderson, representing City Window & Construction and McKinley and Associates, did the honors of presenting Huffman and Holbert with the official keys to the building. 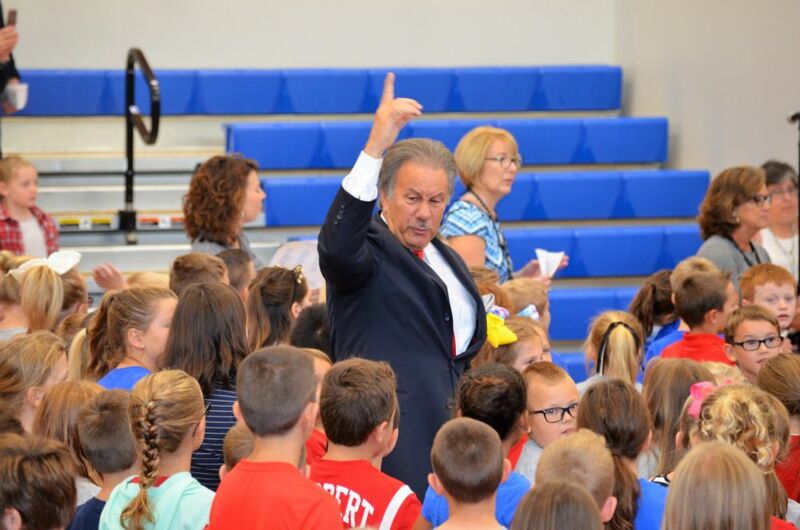 Henderson said his own children, students at JES, were his strongest critics and motivators to get the school completed for the launch of the school year. “We hope you guys really enjoy your new school,” he said. 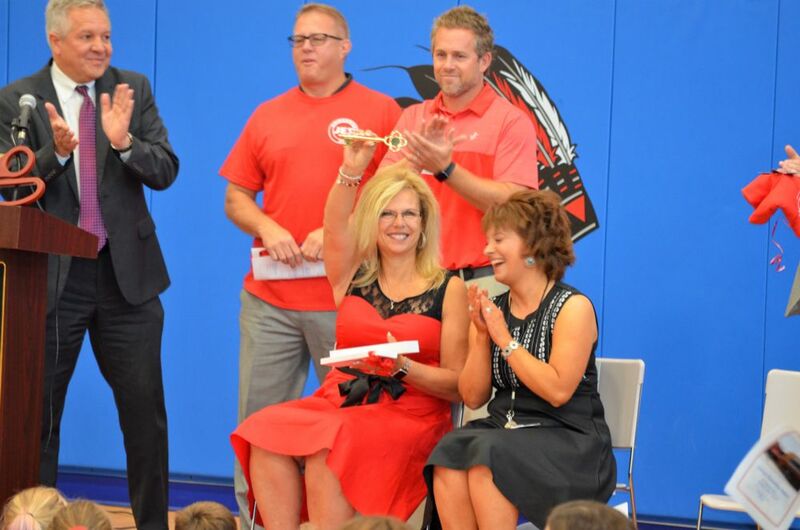 Huffman voiced her appreciation by saying the administrators accepted the key on behalf of every student and every staff member in attendance. 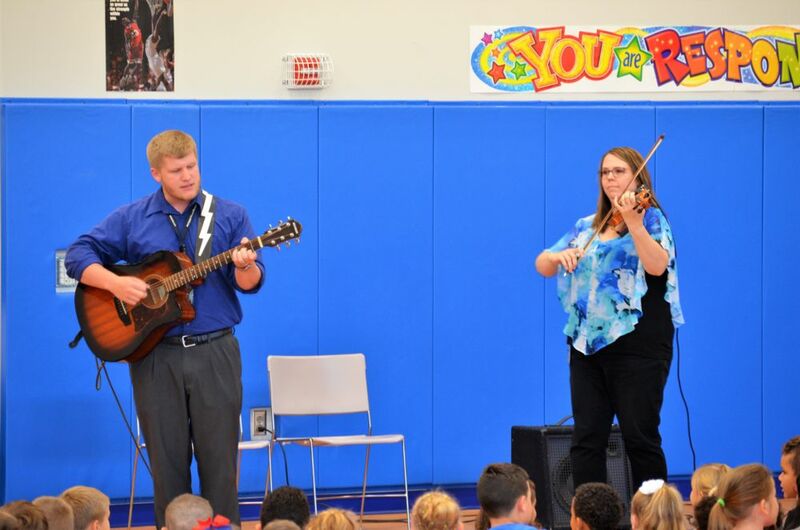 The program closed with special music led by faculty members Chris Broadwater and Tricia Price. The last song was “Country Roads,” loudly sung in unison by the students. Editor's Note: Check back for more photo and video coverage of today's dedication ceremony. See footage of the ribbon cutting below.